In this powerful workshop we will concentrate on how healing works, how to heal yourself and how to channel healing to others. We will cover grounding, healing using channelling, prayers, ways of thinking, how to give and receive healing energy. There will be included a healing mediation for the world. This is an opportunity for you to grow and bring all things back into a state of balance, harmony and deep peace and to feel the divine love that is you. 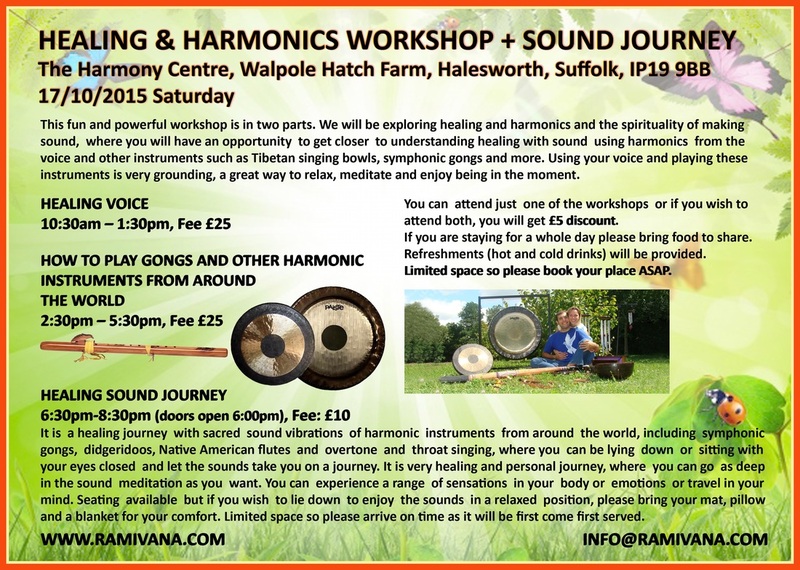 You can attend just the workshop or just the Sound journey or both. If you are staying for a whole day please bring food to share. Refreshments (hot and cold drinks) will be provided. Instruments from around the world will be available to buy. Limited space so please book your place ASAP. We have a new event, it is a intimate workshop in a lovely friend's beautiful home and there will be delicious cake too. The workshop topic is an Introduction to Trance, the numbers are maximum of 8 people, the date is Monday 22 of October from 6pm till 9pm and the fee £35 per person. It is in Melton, Woodbridge, the full address will be given when booking. If you or someone you know would like to come please e-mail us or call us on our mobile 07915858099. You can attend just one of the workshops or 2 or all of them. If you are staying for a whole day please bring food to share. Refreshments (hot and cold drinks) will be provided. Limited space so please book your place ASAP. Explore how mediumship works, how to connect correctly with spirit and angels and to be a channel for peace. 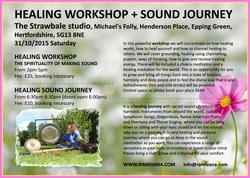 You can attend just the workshop, just the sound journey or both of them. If you are staying for a whole day please bring food to share. Refreshments (hot and cold drinks) will be provided. Limited space so please book your place ASAP. In this powerful workshop we will explore how medumship works, how to connect correctly with spirit and angels and to be a channel for peace. Overtone singing is a wonderful style of singing where the singer makes audible two or more sounds at the same time. It is a beautiful way to relax and express yourself. You will have an opportunity to get closer to understanding healing with sound using harmonics from your voice. Workshop covers the basic mouth positions and theory to get everyone singing overtones. No singing experience required. We welcome you to our HARMONIC CONCERT using sound vibrations of traditional instruments from around the world, including symphonic gongs, didgeridoos, Native American flutes and overtone and throat singing, where you can enjoy and let the sounds take you on a journey around the world. It is a very healing and personal experience. The evening will end with an OPEN DISCUSSION about world instruments. You can attend just one of the workshops or both of them. If you are staying for a whole day please bring food to share. Refreshments (hot and cold drinks) will be provided. Limited space so please book your place ASAP. Overtone singing is a wonderful style of singing where the singer makes audible two or more sounds at the same time. It is a beautiful way to relax and express yourself. You will have an opportunity to get closer to understanding healing with sound using harmonics from your voice. Workshop covers the basic mouth positions and theory to get everyone singing overtones. Guarantee of giving your money back if you will not be able to hear your own overtones on the end of the workshop. No singing experience required. Limited space so please book ASAP. 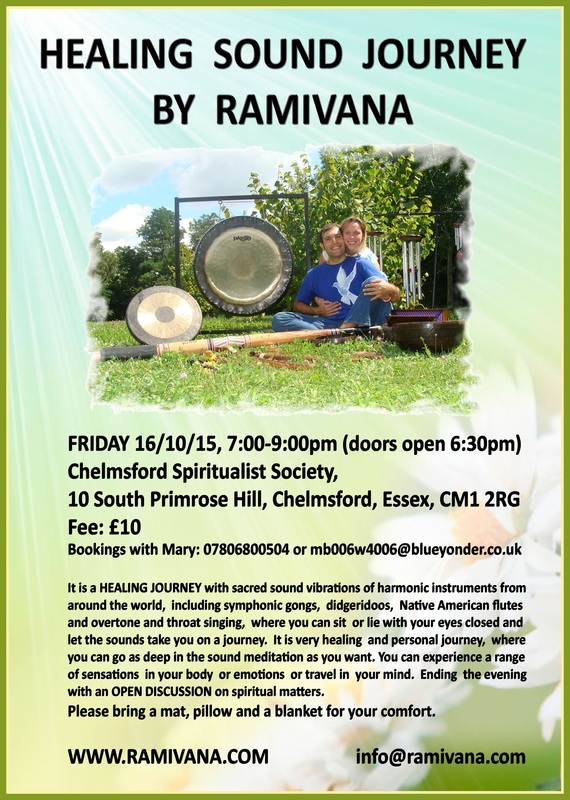 Join Bear and Rami for a relaxing sound meditation using sacred sound vibrations of harmonic instruments from around the world. Enjoy the gentle and rich reverberations of the giant golden gong and the harmonic healing sounds of Rami's overtone singing wash over you, as you journey within to joyful healing and relaxation. Please bring a mat, pillow and a blanket for your comfort. Limited to 30 guests only! Explore the various tools of the shaman, blend with nature, work with elements, animal guides and the spirit world. In this powerful workshop we will concentrate on how healing with sound works, how to heal yourself and how to channel healing to others. We will get deeper into healing with sound using harmonics from the Monochord, Tibetan Singing Bowls, Symphonic Gongs, Kalimbas and more. We will be interactive with these powerful ancient instruments and explore their therapeutic and balancing effect by being played close to the body as well as being in direct contact with the body. This is a great opportunity for anyone interested in sound therapy. Refreshments (hot and cold drinks) will be provided. Please bring a mat, pillow and a blanket for your comfort. Limited to 12 people only so please book your place ASAP. Listen to the many sounds from around the world, explore, feel and see the sound vibration. Have fun interacting with a variety of traditional musical instruments. This fun and powerful workshop is in two parts. We will get deeper into healing with sound using harmonics from the Native American Flutes, Monochord, Tibetan Singing Bowls, Symphonic Gongs, Kalimbas, Tuning Forks and more. We will be interactive with these powerful ancient instruments and explore their therapeutic and balancing effect by being played close to the body as well as being in direct contact with the body. This is a great opportunity for anyone interested in sound therapy. This fun and powerful workshop is in two parts. 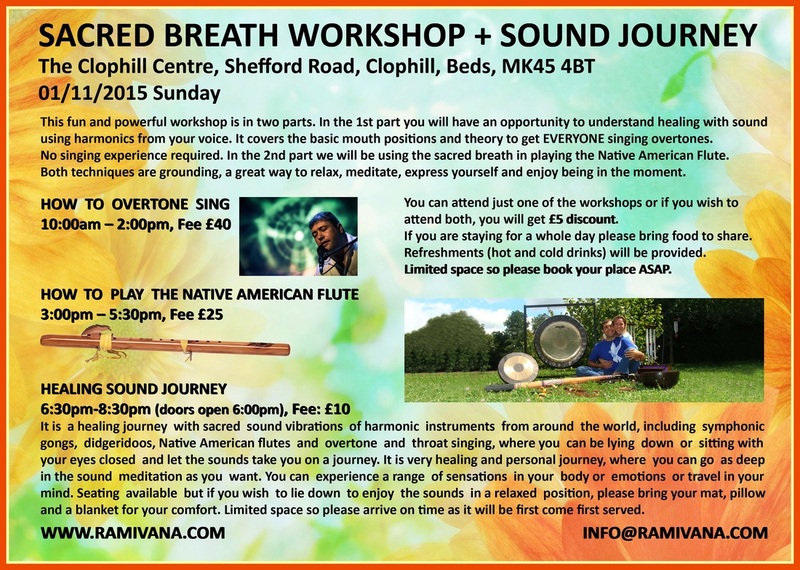 In the 1st part we will be using the sacred breath in playing the Native American Flute. In the 2nd part you will have an opportunity to understand healing with sound using harmonics from your voice. It covers the basic mouth positions and theory to get EVERYONE singing overtones. No singing experience required. Both techniques are grounding, a great way to relax, meditate, express yourself and enjoy being in the moment. Please bring a mat, pillow and a blanket for your comfort and come to relax and enjoy beautiful sound meditation. It is a healing journey with sacred sound vibrations of harmonic instruments from around the world, including symphonic gongs, didgeridoos, Native American flutes and overtone and throat singing, where you can be lying down or sitting with your eyes closed and let the sounds take you on a journey. It is very healing and personal journey, where you can go as deep in the sound meditation as you want. You can experience a range of sensations in your body or emotions or travel in your mind. Seating is available but if you wish to lie down to enjoy the sounds in a relaxed position, please bring your mat, pillow and a blanket for your comfort. Limited space so please book your place as soon as possible. This fun and powerful workshop is in two parts. In the 1st part you will have an opportunity to understand healing with sound using harmonics from your voice. How to be an instrument for healing using voice, channeling, toning, basic overtone singing for the purpose of meditation, relaxation & balance. No singing experience required. In the 2nd part we will be using the sacred breath and learn various techniques of playing the Native American Flute. Both techniques are grounding, a great way to relax, meditate, express yourself and enjoy being in the moment. You can attend just one of the workshops or both. Native American Flutes will be provided for the workshop and they are also available to buy (prices from £55 to £255). We would like to invite you to this wonderful workshop where we will be exploring our healing voice. We will get deeper into healing with sound using harmonics from our voice. You will have the opportunity of learning how to be an instrument for healing using channeling, toning, basic overtone singing, sound and silence for the purpose of meditation, relaxation & balance. This is a fun, powerful and inspiring spiritual development day. No previous singing, healing or meditation experience necessary. This is a great opportunity for anyone wanting to become friends with their voice. Refreshments (hot and cold drinks) will be provided. Limited space so please book your place ASAP. This powerful workshop is in two parts. Part 1: We will explore how medumship works, how to connect correctly with spirit and angels and to be a channel for peace. Part 2: We will go deep into sound therapy using the Monochord, Tibetan Singing Bowls, Symphonic Gongs, Kalimbas and more. We will be interactive with these powerful ancient instruments and explore their therapeutic and balancing effect by being played close to the body as well as being in direct contact with the body. You can attend just one of the workshops or if you wish to attend both, you will get £5 discount. If you are staying for a whole day please bring food to share. Refreshments (hot and cold drinks) will be provided. Limited space so please book your place ASAP. We will concentrate on how healing with energy works, how to heal yourself & how to channel healing to others. You will have an opportunity to get closer to understanding healing with sound using harmonics from your voice. No singing experience required. We will be using the sacred breath and learning various techniques of playing the Native American Flute. 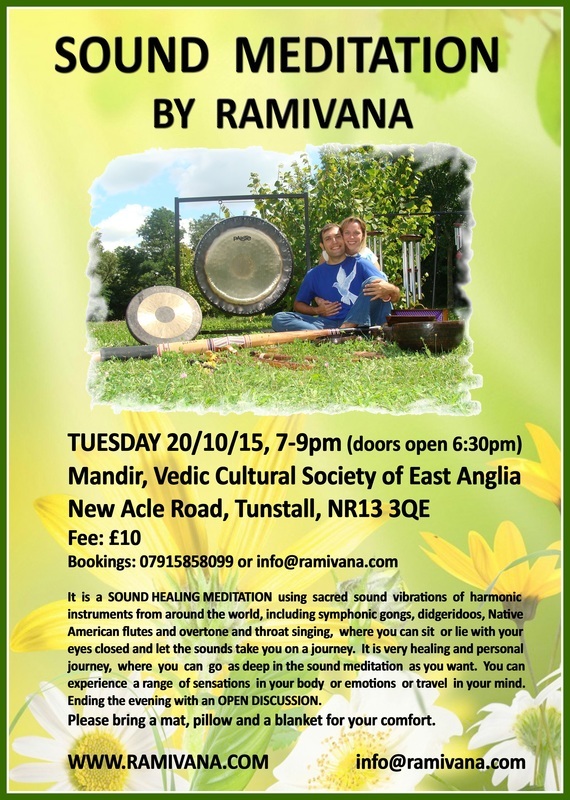 We will go deep into sound therapy using the Monochord, Tibetan Singing Bowls, Symphonic Gongs, Kalimbas & more. We will explore their therapeutic & balancing effect by being played close to the body as well as being in direct contact with the body. You can attend just 1 of the workshops, or if you attend 2 you will get £5 discount, if 3 you will get £10 discount, or if you wish to attend all 4, you will get £20 discount. All workshop instruments will be provided and also available to buy. If you are staying for a whole day please bring a dish to share. Refreshments (hot & cold drinks) will be provided. If it is cold please bring thick socks & comfortable warm clothing. Limited space to 10 people. Please book your place ASAP. 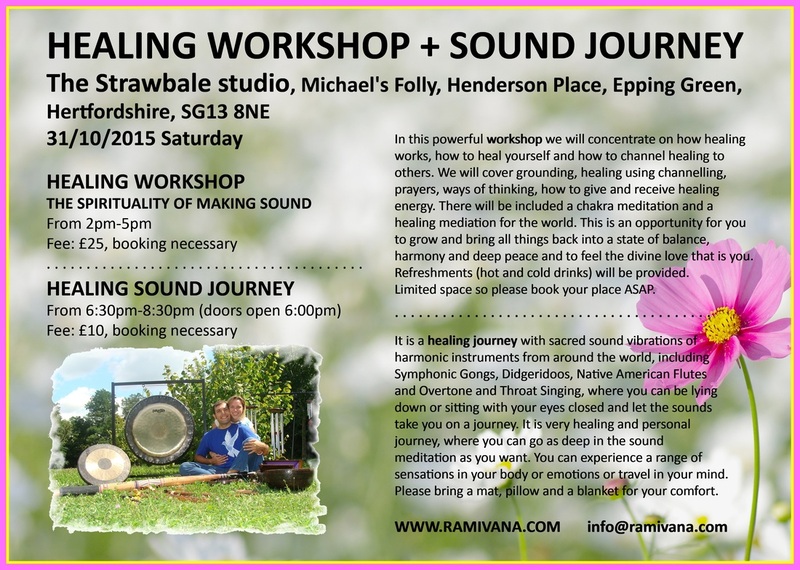 In this powerful workshop we will concentrate on how healing with sound works, how to heal yourself and how to channel healing to others. We will get deeper into healing with sound using harmonics from the Monochord, Tibetan Singing Bowls, Symphonic Gongs, Kalimbas and more. We will be interactive with these powerful ancient instruments and explore their therapeutic and balancing effect by being played close to the body as well as being in direct contact with the body. 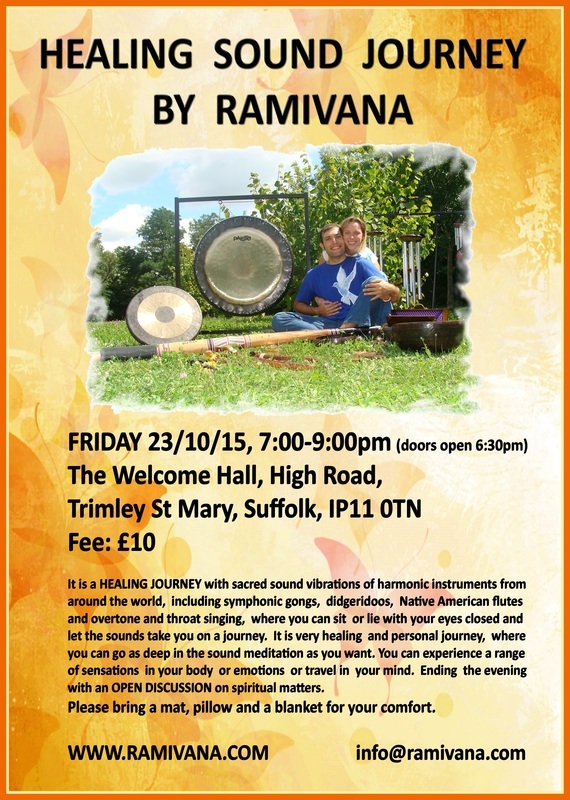 This is a great opportunity for anyone interested in sound therapy. Refreshments (hot and cold drinks) will be provided. Limited space so please book your place ASAP. This powerful workshop is in 2 parts. Part 1: We will concentrate on how healing with energy works, how to heal yourself and how to channel healing to others. Part 2: We will go deep into sound therapy using the Monochord, Tibetan Singing Bowls, Symphonic Gongs, Kalimbas and more. We will be interactive with these powerful ancient instruments and explore their therapeutic and balancing effect by being played close to the body as well as being in direct contact with the body. This fun and powerful workshop is in two parts. 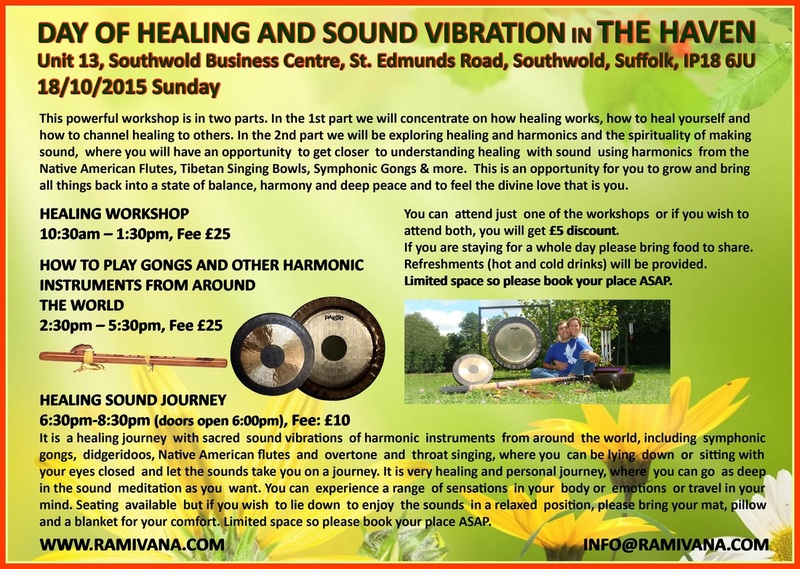 We will be exploring healing and harmonics and the spirituality of making sound, where you will have an opportunity to get closer to understanding healing with sound using harmonics from the voice and other instruments such as Tibetan singing bowls, symphonic gongs and more. Using your voice and playing these instruments is very grounding, a great way to relax, meditate and enjoy being in the moment. You can attend just one of the workshops or if you wish to attend both, you will get £5 discount. If you are staying for a whole day please bring food to share. Refreshments (hot and cold drinks) will be provided. all things back into a state of balance, harmony and deep peace and to feel the divine love that is you. Limited space so please book your place ASAP. This fun and powerful workshop is in two parts. In the 1st part you will have an opportunity to understand healing with sound using harmonics from your voice. It covers the basic mouth positions and theory to get EVERYONE singing overtones. No singing experience required. 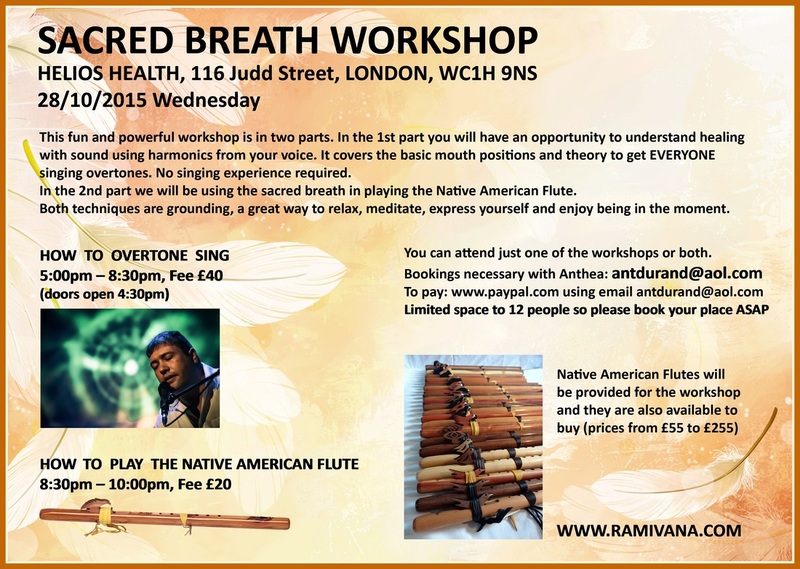 In the 2nd part we will be using the sacred breath in playing the Native American Flute. Both techniques are grounding, a great way to relax, meditate, express yourself and enjoy being in the moment. In this powerful workshop we will concentrate on how healing works, how to heal yourself and how to channel healing to others. We will cover grounding, healing using channelling, prayers, ways of thinking, how to give and receive healing energy. 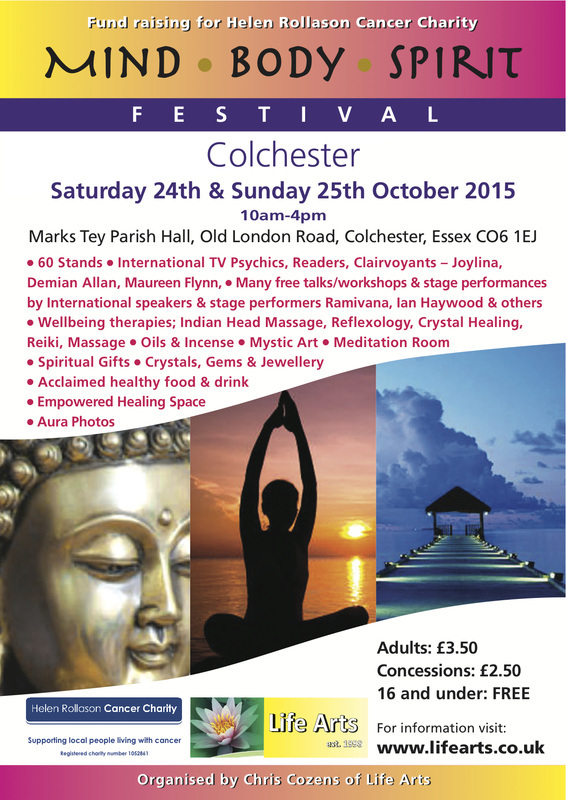 There will be included a chakra meditation and a healing mediation for the world. This is an opportunity for you to grow and bring all things back into a state of balance, harmony and deep peace and to feel the divine love that is you. Refreshments (hot and cold drinks) will be provided. It is a healing journey with sacred sound vibrations of harmonic instruments from around the world, including Symphonic Gongs, Didgeridoos, Native American Flutes and Overtone and Throat Singing, where you can be lying down or sitting with your eyes closed and let the sounds take you on a journey. It is very healing and personal journey, where you can go as deep in the sound meditation as you want. You can experience a range of sensations in your body or emotions or travel in your mind. Please bring a mat, pillow and a blanket for your comfort.